1928 For various reasons there was a loss of coaling trade to other ports in North Africa and elsewhere. To counteract this, work began on the mechanisation of the local coaling equipment. Massive gantries and grabs were installed on the North Mole at great cost. Prior to this all coaling operations had been done by manual labour. The men who had been responsible for heaving coal and whose old jobs were now on the line were now to develop into the spearhead of the labour movement in Gibraltar. When it was Maria Luisa's (2.4) turn to take him out she was less worried about his lack of tears than she was about his rather pale complexion and for a while insisted on daubing his cheeks with rouge. That year General Sir Alexander J. Godley took over as Governor, and immediately introduced a duty on perfumes and increased those on wines and spirits. Had he been old enough to be aware of the Governor's actions, Eric would have been totally indifferent to the first bit of legislation and very annoyed with the second. General Sir Alexander J. Godley. To his men he was cold and aloof. At a personal level he was obsessed with hunting. A contemporary postcard view of the Rock from a liner. I am not sure where this comes from but it falls somewhere between a pretty picture postcard and romanticised holiday brochure material. Personally I rather like it! 1929 On the 26th of July Felipe Chipulina died. He seems to have been a handsome, clever individual with a complex but seriously flawed character. His gambling debts and other misdemeanours had often been a source of constant trouble and had invariably been settled or covered up by his father for the sake of family honour. He had also been drunk for most of his adult life. In fact he died of alcoholism. Despite his many faults he seems to have been able to charm most of the other members of his family most of the time. Various theories have been put forward to explain Felipe's often disruptive behaviour. Among these was that he had suffered from sunstroke in his youth and it had affected him permanently. Another was that he was partially blind in one eye and was frustrated by it. His involvement as a scab during the coalheavers' strike was also blamed in that it had supposedly involved him with bad company. It was also suggested that Felipe had once had a relationship with a cleric of dubious repute, who was later caught tampering with little girls and was exiled to San Roque by the local Bishop. His sister-in-law Lina often used the term salamero to describe him and it seems he got more attention from his bevy of aunts than his brother Pepe. Lina, in fact, was probably the exception to the family rule, in that she generally disliked Felipe and thought he was messing up her marriage by turning up drunk and argumentative at the most inopportune of moments. Once, when he had returned home in a particularly debauched state while Pepe was away, she had seriously considered braining him with some implement or other rather than allow him to enter the room she was in. Other snippets show him up in better light. For example he was reputed to have passed the local Civil Service exam with flying colours without going to too much trouble, and his first pay packet was handed to his mother untouched. His mother often used this gesture to argue with others how much they misjudged her son. The truth was that he later cadged back more than the value of his pay-packet over the month in instalments. In October the Stock Market crashed in Wall Street. It was the time of the Great Depression. Politics and the generally depressed economy also continued to dominate the agenda in Gibraltar. The elected City Councillors again appealed to the Governor to allow a majority of elected members. He ignored them. Nevertheless there was some progress. The first publicly built tenement block was opened. It was the first time that any real effort had been made to house the poor of Gibraltar. 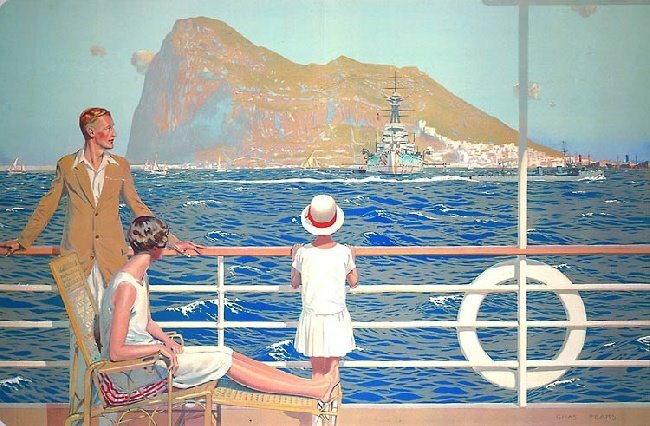 Also that year the people of Gibraltar were able to see the world's newest technological wonder. 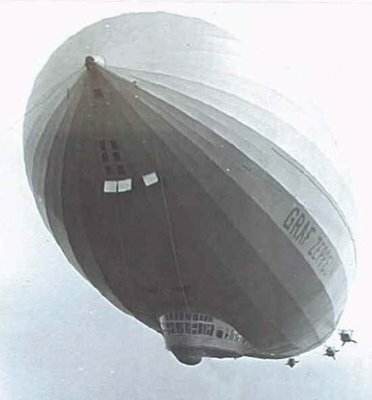 The Graf Zeppelin, on its show-off world tour, flew slowly and majestically over the Rock. 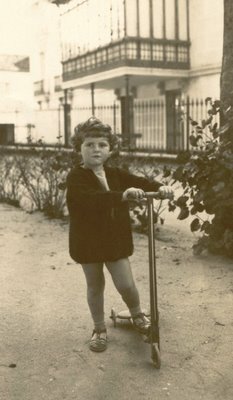 My sister Maruja’s favourite photograph of herself. It was taken in Ronda. On the back of the photo her mother wrote: ‘Ronda 1929 - Para Memo Mary con muchos besos de Maruja.’ Somebody else has also written that she was 3 years and eleven months old. 1930 The middle classes also had their perk. 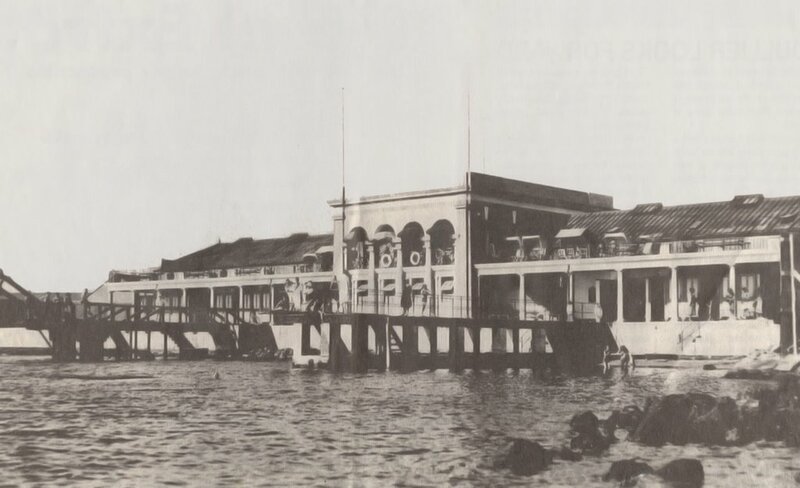 The Montague Bathing Pavilion opened. Although it was probably an elegant place at the time, the Chipulinas rarely if ever frequented it. They preferred either the MRC or Eastern beach for their bathing. Joe Letts, who by now had retired from the dockyard, was supervisor of the pavilion for a while. He did not last long as he died soon after. The event of the year, however, was the discovery on the 1st of December of the body of a lady called Miss Maria Luisa Bossano, lying in a pool of blood in her house in Market Lane. She was an aunt of the Canessa family who were close friends of the Chipulinas. The case was still remembered for years afterwards by members of her generation. Ernesto Opisso, a man of low intelligence, was subsequently arrested and tried twice for her murder as the jury were unable to arrive at a conclusion the first time round. He was finally found guilty, but many working class Gibraltarians were not convinced that he was getting a fair trial. Petitions for a reprieve were delivered to and turned down by the Governor. On the night of his execution there were violent popular demonstrations by the coalheavers, taxi drivers and sundry labourers outside the prison gates, and the Governor was forced to resort to sending in the troops armed incongruously with hockey sticks to disperse the crowds. Opisso's execution was the 12th to have taken place since the Gibraltar Police had been formed. He also had the dubious honour to be the first, and hopefully the last Gibraltarian to die on the scaffold at the Civil Prison. Although the whole episode was one of generally unrelieved unpleasantness, a touch of humour managed to intrude into the due process of the trial. Opisso's defence lawyer was a gentleman by the name of Pisani who was said to be very good. Despite his reputed cleverness, however, it seems that he needed a periodic touch of the hard stuff to keep his wits about him. Unfortunately there was an understandable 'no drinking in court' rule, but he got round this by dipping bread into a glass of whisky whenever he felt the urge. On one occasion the Judge saw him at it and asked him politely whether he was drinking, Pisani is reputed to have answered: 'Not drinking m'Lud, eating.' Which answer is supposed to have satisfied the court. In Spain tensions were increasing and civil discontent forced Miguel Primo de Rivera to resign. It was probably somewhere around this period that the Calpe Rowing Club was involved in a rather unsporting regatta in Malaga against one of the local crews. The race involved turning the boats round buoys which were moored a short distance from one of the moles. As the Calpe crew approached the turn, their buoy began to drift away from them and move ever closer to the mole. They just managed to scrape through the ever narrowing gap and get away. It was only after the race that they found out that someone on the mole had been tugging at a line attached to the buoy. Following Rivera's resignation, the King, Alfonso XIII, showing far less staying power than Bomba, left Spain without abdicating and the Second Spanish Republic was born amid considerable public enthusiasm. 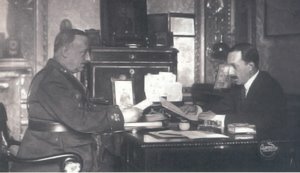 General Primo de Rivera and Alfonso XIII. The Spanish dictador and his puppet King before his resignation. The new Spaunish constitution was a model of progressive idealism: which was more than could be said for its anthem. The opening bars were almost the same as 'For he's a jolly good fellow' and it was invariably sung to popular lyrics that harked back to more reactionary days. The Yanito version, however, added an additional veneer of absurdity whereby the poor man was buried in the middle of the Gibraltar dockyard. In February Municipal elections were held in Spain. In La Linea the Left swept the day and the Right only managed to obtain 800 votes out of a total population of some 65000. And even some of these, it was rumoured, were purchased for 25 pesetas apiece. Gibraltar, however, was busy with other matters. An ape count showed that there were only ten of these creatures left on the Rock and a completely separate count uncovered the fact that approximately 20% of the human population were wholly illiterate. The Governor, Sir Alexander Godley was galvanized into action. He immediately ordered the importation of seven young apes from Morocco. That year Memo fell seriously ill and was taken into the parlour at 256 Main Street. Outside, a very young Eric hung around the firmly shut door, mystified by what was going on. On one of the parlour walls there was a large ceramic plate depicting a monastery in bas-relief. When Memo finally died the parlour was redecorated and the plate disappeared. Many years later it came to light wrapped up in brown paper on top of an old wardrobe. It was eventually used to decorate one of the walls of the topflat of Crutchett's Ramp. 1932 Maruja was now seven years old and it was time for her to start her schooling. My parents enrolled her in the Loreto Convent School close to the Governor's residence. School tennis, probably for snobbish reasons, was actually played in the courts of the Governor's House. The school building stood opposite the Town Range Barracks, and the senior girls took great delight in peeking through the rear window of the school at the soldiers going about their business. Lessons in P.E. 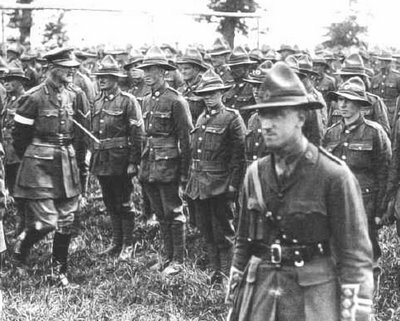 were in the hands of an army drill instructor of impressive bearing and impeccable attire. The girls were also neatly uniformed. For those interested in young ladies underwear, they wore knee-length navy-blue bloomers for most of their activities. Not long after she had joined the school there was one particularly memorable occasion when she danced to the music of one of those group ensembles that the nuns were so fond of organising and rehearsing to perfection. Inevitably, the Governor and his wife were always invited to the première. The anecdote is that on the opening night, Maruja accidentally kicked a basket of flowers right across the dance floor. On St. Patrick's and on Empire Day, it was traditional for the girls to be taken by the nuns on a picnic to the Alameda Gardens. Among the nuns who taught her was a certain Mother Dympna who had also taught Lina in her time. That year the coalheavers, God bless them, went on strike again. 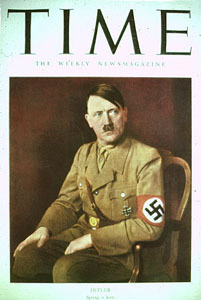 1933 In January Hitler became Chancellor of Germany and General Sir Charles H. Harrington became Governor of Gibraltar. General Sir Charles H. Harrington? There was some economic good news as the coal trade was regained due to the mechanisation of the equipment. New technology was also making inroads in the home and the children were now often entertained by a sort of magic lantern with a handle that produced moving images of sorts as well as an irritating squeak at every turn. The 'films' were mostly cartoons with a moral of the 'Grasshopper and the Ant' variety, and the limited repertoire was soon learned off by heart. Nevertheless it was still the thing to trundle out on special occasions. Members of the Wills Family posing somewhere in the Alameda Gardens. 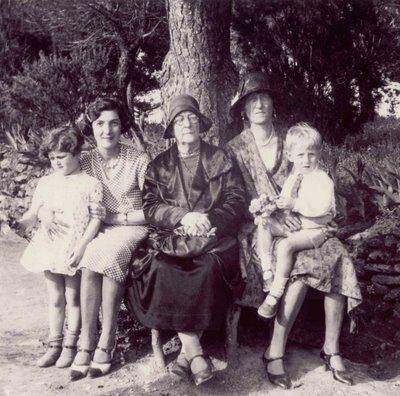 From left to right, Maruja Chipulina, Mercedes Wills, her mother Mercedes Letts, and her husband’s mother Mary Wills ne Relle with Mercedes’ son Maurice on her knee. Mercedes Wills was known to her family as either Babs or Mercedita. She was my mother’s cousin and very good friend. 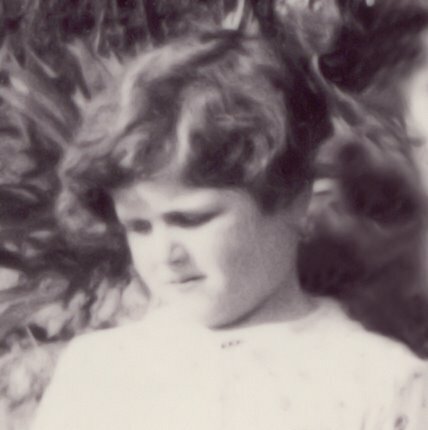 Bab’s mother Mercedes Letts was Maria Luisa’s (2.4) sister. They both looked very alike.Mary Wills was renowned for her delicious scones which was somewhat surprising considering her German roots. Maurice Wills was often referred to as Baby Maurice to distinguish him from his father.